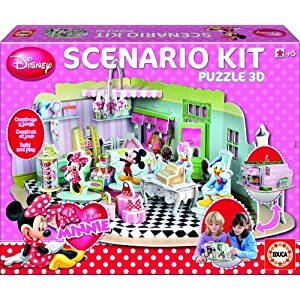 SCENARIO 3D kits are puzzles which transforms into delightful Disney worlds. I loved making this Minnie Mouse Boutique with my daughter then watching her enjoy playing with it. We love Minnie Mouse and creating her fashion boutique with clothes hangers and all the other accessories was great fun in. I love games that have a really long play life. Jigsaw puzzles can get boring when they have been put together a few times so I generally buy and resell them at car boot sales. The foam pieces are designed to be played with again and again in this puzzle and its like a little playset. Brilliant for imaginative play and story creating.